Deere and Company is hoping the popularity of the robotic vacuum cleaner will translate to lawn care. 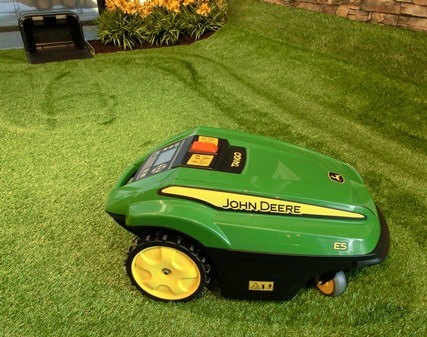 John Deere’s Tango E-5 autonomous lawn mower is now on display for the first time in the U.S. at the John Deere Pavilion in the Quad Cities. Pavilion manager Brigitte Tapscott says while some home owners may enjoy mowing their lawn, others could leave that work to Tango. “You can have that time back, spend time with your family and do what you enjoy versus mowing your lawn,” Tapscott says. The machine was introduced in Europe just last year and is produced in Germany. Deere is now studying whether to sell it in the U.S. “It can be setup on schedule to run during the day or night, rain or shine,” Tapscott says. The Tango recharges itself automatically at a base station and weighs 34 pounds. The cutting height is adjustable and it’s nearly silent. “It is set on boundary wires that are underground. The dealer will help set that up…and (the mower) will stay within those perimeters,” Tapscott says. The current price tag is about $2,600, plus tax and dealer installation. The Tango will be on display at the Deere Pavilion in Moline, Illinois for the next 12 to 18 months.